Called wetland ponds, settling ponds, or storm water detention ponds, these natural-like products of environmental engineering work by capturing contaminated runoff before it enters a larger water body. This allows phosphorous (the main culprit in algae blooms and degraded water quality) to settle at the bottom, becoming nutrients for wetland plants. The new pond sites have been named Amelia (the original name of Lake Nokomis), Nokomis Knoll, and Gateway. The names resulted from a comprehensive plan developed by the citizen-led Blue Water Commission (BWC) to address water quality concerns for Lake Nokomis and Lake Hiawatha. The Lake Nokomis wetland ponds will be integrated into park landscaping, with each of the three ponds surrounded by distinctive wildflowers, grasses, and water plants. All existing trails around Lake Nokomis will stay the same. What is involved in the cleanup of Lake Nokomis and Lake Hiawatha? How do the ponds work and will they stand out in the park? Wetland settling ponds are an environmentally friendly, gravity-based method of cleaning surface water. Settling ponds receive storm water runoff from storm water drains. Phosphorous clings to the grit in the runoff and settles to the bottom of the ponds. Nuisance algae blooms in Lake Nokomis are caused by excessive phosphorous. Most of the phosphorous originates in the local watershed and is carried by runoff. Other sources of pollution, like oils, pesticides and sediments, are also carried in runoff from the neighborhoods. The goal for Lake Nokomis is to remove 900 pounds of phosphorous per pond on an annual basis. In terms of effectiveness, the wetland settling ponds installed at Lake Calhoun have prevented the growth of an estimated 180,000 pounds of algae by removing phosphorous. An estimated 30,000 pounds of suspended sediments were also removed. Lake Calhoun was recently given an "A" grade in water clarity and water quality. 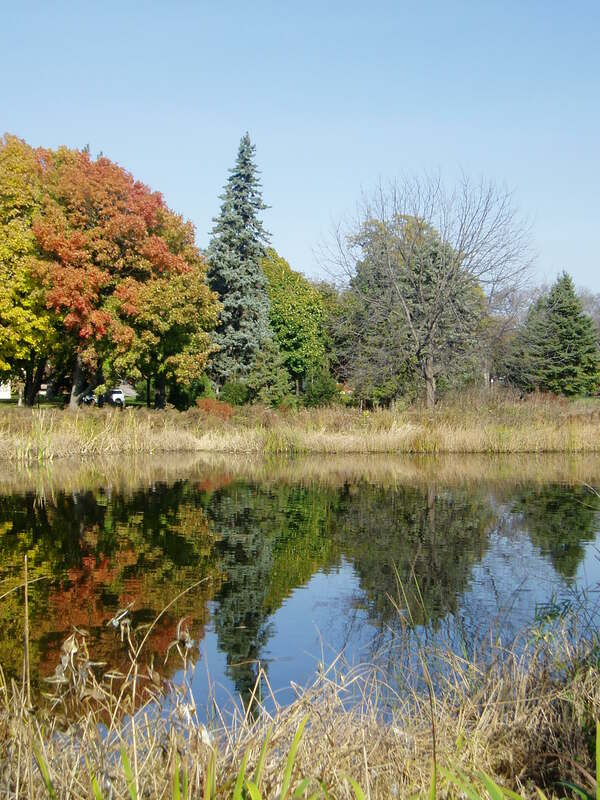 The Lake Nokomis ponds will be landscaped with prairie and wetland plants, which will benefit from the phosphorous. The ponds? design will be integrated into existing park land, enhancing the natural beauty of the park. What do grit chambers do and are they effective? Grit chambers are below-ground chambers that are part of the storm water drainage system. Two will be installed at 50th Street and Woodland Avenue and 53rd Street and Shoreview Avenue. At Lake Nokomis, a new type of grit chamber design will be used. The principle of gravity is used to design a circular prefabricated concrete holding tank that allows the grit and debris to sink to the bottom, keeping it from entering the lake. What other strategies are being applied to clean up the lakes? A number of actions are planned to work together in cleaning up the lakes, including carp removal later this winter from Lake Nokomis. Carp tend to stir up lake bottoms where the phosphorous has settled, hurting water quality and creating algae bloom. Who's involved in the cleanup? The Blue Water Partnership includes The City of Minneapolis, the Minneapolis Park and Recreation Board, and the Minnehaha Creek Watershed District. The partnership is implementing the recommendations of the BWC's 1998 report. The BWC was formed by citizens from Nokomis East, Standish Ericsson, and Hale Page Diamond Lake neighborhoods, and the Citizen Advisory Committee (CAC). Minnehaha Creek runs next to Lake Nokomis and through Lake Hiawatha. The entire Minneapolis Chain of Lakes is part of the Minnehaha Creek Watershed, starting west of Lake Minnetonka and ending at the Mississippi River. Minnehaha Creek Watershed District is providing the majority of funding, as well as engineering and communication expertise for the Lake Nokomis/ Lake Hiawatha water cleanup. MCWD is a small autonomous unit of government and the second largest watershed district in the metro region. MCWD works in partnership with cities, townships, and citizen groups to help improve the water quality in most of the lakes and streams in the watershed. Will there be any traffic delays with construction of the grit chambers and the ponds? According to the City and engineers for the project, there will be minor disruptions of traffic for a week at a time when the two grit chambers are installed. There should be no disruption to traffic when the ponds are built later. During the life of the construction project, this web site will be the primary source for providing regular updates. Neighborhood newspapers and newsletters will also be a good source of information. In recent years, neighborhood surveys in the Lake Nokomis area determined that the water quality in Lake Nokomis and Hiawatha was one of the primary concerns for area residents. As a result, the Blue Water Commission (BWC) was conceived in 1996 by three Minneapolis neighborhoods-- Hale Page Diamond Lake, Nokomis East, and Standish Ericsson. The BWC consisted of representatives from the three neighborhoods and; the Cities of Minneapolis and Richfield; the Minneapolis Park & Recreation Board; the Minnehaha Creek Watershed District; Hennepin County; the Metropolitan Airports Commission; and environmental groups. Technical assistance to support the BWC was provided by the Minnehaha Creek Watershed District, the Minneapolis Parks & Recreation Board, and a Technical Advisory Committee. The Blue Water Commission completed its work by publishing a final report in May 1998, "Blue Water Commission Report and Recommendations for the Management of Lake Nokomis and Hiawatha." BWC goals aimed to eliminate nuisance algae blooms, protect public health, balance aquatic diversity with human enjoyment, provide a better fish and wildlife habitat, and provide for a more natural transition from the land to the lakeshore. Removing carp, modifying the outlet structure, building three wetland settling ponds, installing grit chambers, providing a lake-wide alum application, street sweeping, and implementing phosphorus fertilizer restrictions. Wetland settling ponds have been installed at the Hiawatha Golf Course. A beach curtain is recommended to improve swimming conditions. Other long-term actions include street sweeping, managing the upstream watershed, and implementing phosphorus fertilizer restrictions. Carp are notorious for stirring up phosphorous on the bottom of area lakes. Recently, six to eight thousand pounds of these non-native "rough fish" were removed from under the ice at Lake Nokomis (the MCWD and the fishing experts anticipated as much as 30,000 pounds at the outset of the operation). The catch of the day was part one of the Blue Water Partnership's efforts to reduce the phosphorous load in the lake. Phosphorous often causes nuisance algae blooms. The blooms, in turn, can reduce water clarity and quality. In a rare display of an old Minnesota trade, the fish harvest was handled by a 10-person family crew with 2,400-feet of net during very cold winter temperatures on January 24. The commercial fishing company from Waterville, MN., known as the Geyer Brothers, first threaded its nets through select holes cut in the 16-inch-thick ice out in the middle of the lake. Like any good angler, they went to work well before sunrise that morning. The crew then carved out a staging area -- halfway across the lake from original holes -- at the northeast corner near the swimming beach. This open section of water was about eight by 12 feet, and served as the catch area where the haul would be pulled in using a rope line connected to the nets and a winch powered by a small generator on the back of a pickup. By 11 a.m., the first fish was pulled from the rigging, a beautiful eight-pound pike, which was promptly returned to the lake. Next up, a tiger muskie, around 12 pounds. A keeper for anybody else, this prized game fish was also returned to the water so one lucky kid or adult might catch it this coming season. Finally, around 11:30 a.m., the first carp emerged, followed 20 minutes later by a large school of about six-to-eight hundred carp, averaging around 10 pounds each, along with hundreds of small crappies, a few scattered walleyes, bullheads and suckers. Those fish were also put back into Nokomis. The carp, however, were eventually trucked off to become fertilizer or livestock feed. Carp on both lakes and Hiawatha will soon be removed in a similar seining operation next winter. It won?t be long, however, before fishing enthusiasts of all ages begin tossing lines in from the banks and docks of Lake Nokomis, while gentle warm breezes and a glaring sun play on their poles. The pictures below tell the story of this commercial fish harvest, an old, rugged trade that is fast disappearing in Minnesota. The carp seining is just the first phase of the improvement process slated for the lake. Meanwhile, construction of three nearby settling ponds to capture stormwater runoff and other sediments – plus the installation of two grit chambers and a new weir or dam at Minnehaha Creek and the Lake – is well underway now. Taking its lead from Nokomis East residents voting on how to best invest their NRP funds, the Nokomis East Neighborhood Association's Environmental Task Force has accomplished several goals in a project to improve Lake Nokomis. These goals included improvements to the park, to the quality of water in the lake, and to sustainable plantings that would support both visual and water-quality improvements to the lake. In collaboration with partners from HPDL, SENA, other neighborhoods, local and statewide agencies, especially the Minnehaha Creek Watershed District, the MPRB and private organizations, Nokomis East invested more than $300,000 in NRP funds to accomplish many hundreds of thousands of dollars of environmental goals at the Lake.